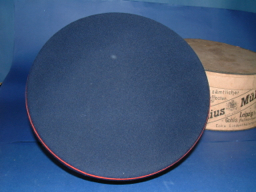 C.40 WURTEMBERG PIONEER / ARTILLERY REGIMENT OFFICERS CAP. A Wurtemberg Officers very fine quality walking out cap in excellent / mint condition. with its original makers / suppliers storage box .Dark blue crown with red piping and black cap velvet cap band with red piping to top and bottom. Cream watermarked satin to crown Cream leather sweat band With cream lining and underside to peak . Good shape and 100% original, not a rare cap but this one is in exceptional condition with its dark green makers box by joh Wachter Tauber Bischofsheim. ( A town in the west of the state of Wurtemberg ) The officers cap is in excelent condition The Box is quite desirable in its own right. 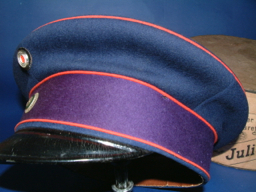 C. 42 PRUSSIAN ARTILLERY / ENGINEER REGIMENT OFFICERS CAP. 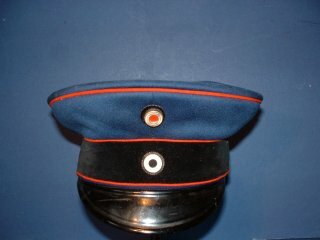 A Prussian Army Officers cap in Very good condition. 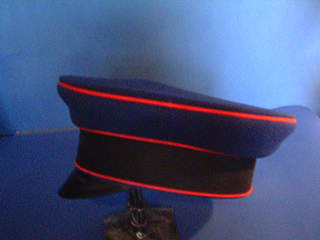 Dark blue crown with red piping and black cloth cap band with red piping to top and bottom. 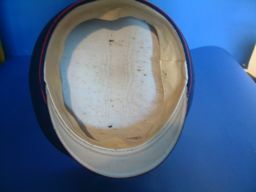 Cream watermarked satin to crown Cream leather sweat band White underside to peak. Officers name imprinted in gold into silk. ''Deutsche Offizier Verine'' impressed into the leather sweatband. Some small moth bites to the cap but do not detract.. Good shape and 100% original condition .